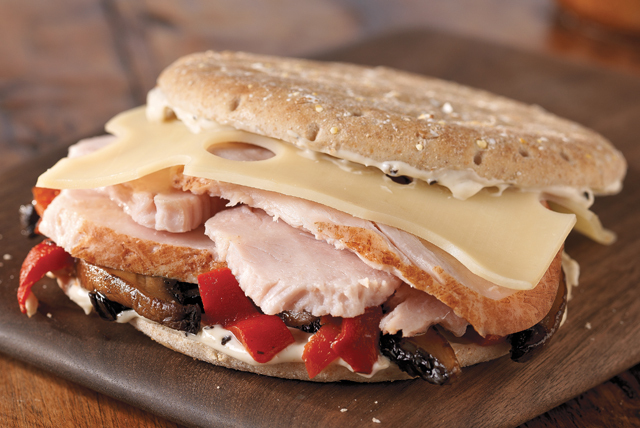 A turkey and Swiss cheese sandwich gets fancier—and tastier—with grilled portobello mushrooms and roasted red pepper strips. Spread cut sides of bun with mayo. Treat your family to a break in the routine. Have sandwiches as part of dinner one night for a change. This tasty sandwich is a great addition to any brown-bag lunch. Keep refrigerated until ready to serve. Heat grill to medium heat. Drizzle 1 tsp. olive oil onto 1 (6-inch) portobello mushroom. Grill 5 to 7 min or until mushroom is tender, turning frequently.